Preparation and dosage: Tincture: take 2 drops, 3 x daily blended with other digestive tinctures. Tea: brew 1 stick in a cup of soy or milk. Simmer 10 minutes. Drink 3 x daily. 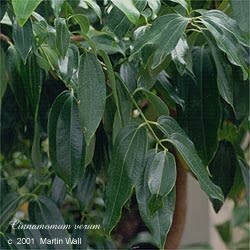 The genus name Cinnamomum derives from the Greek name for the spice, kinnamomon, which may in turn derive from the Malaysian kay manis, "sweet wood." The common name cassia is believed to derive from the ancient Hebrew qetsilah, which perhaps means "spice." Cinnamomum aromaticum is native to southern China, while C. verum is native to Sri Lanka, but both species are naturalized and cultivated in the tropics. Both are small evergreen trees with oval oblong leaves 5 to 9 inches in length. The yellowwhite flowers are borne in panicles. The flowers are followed by small purple berries that each bear a single seed. To make cinnamon spice, the thick bark of the tree is peeled away and layers are left to dry, during which time it curls up. The dried bark is then sold in pieces or ground up. Cinnamon helps dry dampness, stimulates the digestive tract, and has activity against staph infection and botulism. It also stimulates circulation, and its prolonged use is known to beautify the skin and promote a rosy complexion. It is especially helpful for people who are always cold and have poor circulation. It is used in the treatment of appetite loss, arthritis, bedwetting, colds, colic, cough, diarrhea, dysentery, dysmenorrhea, erectile dysfunction, fatigue, flatulence, flu, halitosis, headache, hypotension, irregular menses, lumbago, malabsorbtion, nausea, poor circulation, prostatitis, rheumatism, tuberculosis, and vision problems. Topically, cinnamon can be used in footbaths to treat athlete's foot and as a bath herb in treatments for chills and sore muscles. As a steam inhalation it is beneficial in cases of colds, coughs, and sore throat. It can be prepared as a wash to get rid of fungal infections, such as athlete's foot. It is often included in massage oils for its warming properties, and it is often included in toothpastes for its ability to freshen breath and inhibit bacteria. Aromatically, the pleasant scent of cinnamon stimulates the senses yet calms the nerves. During the age of exploration of the fifteenth and sixteenth centuries, cinnamon was among the most sought after of spices, and is still incredibly popular in cuisines around the world. When added to dairy dishes, it enhances their digestibility. Cinnamon was used in ancient Egypt in the mummification process. It was also used in ancient times to prevent food from spoiling. In sachets it repels moths. It is sometimes included in hair rinses to highlight dark hair and in massage oils to promote sexual arousal. Avoid cinnamon in cases of hot, feverish conditions; excessive dryness; hemorrhoids, dry stools, or hematuria (blood in the urine). Avoid large amounts during pregnancy and, because it can decrease a mother's milk supply, while nursing. Avoid therapeutic doses for extended periods of time. Doses of more than 2 grams could cause delirium, hallucinations, and convulsions.